Happy Friday, everyone!! 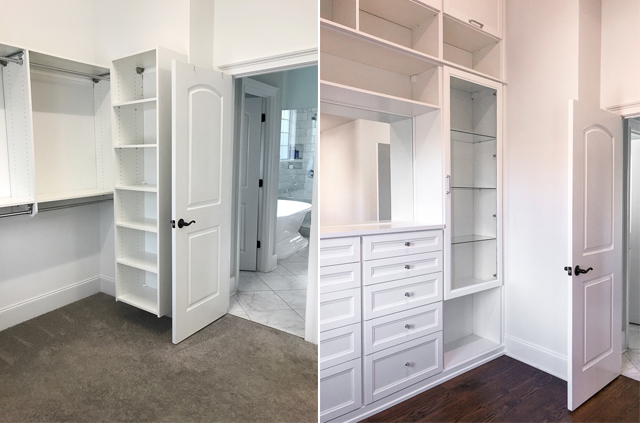 I’m so excited to FINALLY share my completed master closet renovation with California Closets today! When I first moved into our house, the master closet had carpeting and a LOT of wasted space. We have high ceilings in our closet, and I wanted to take advantage of all the empty wall space. 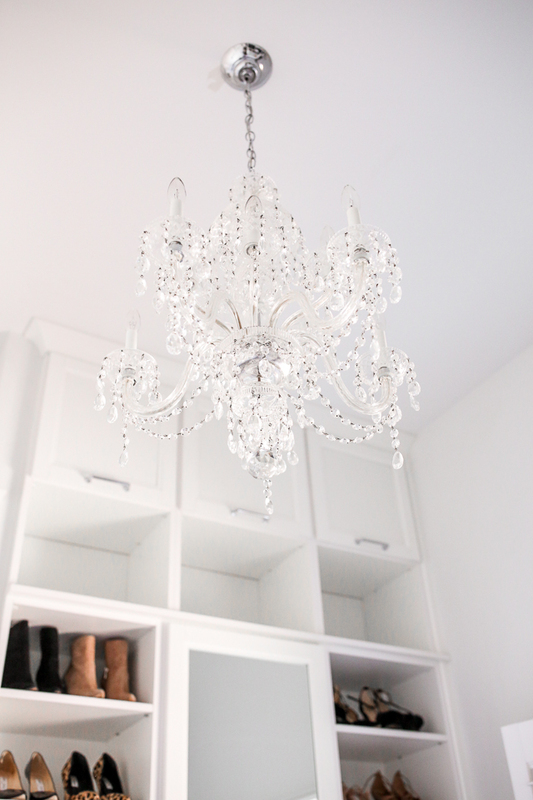 I also envisioned it being both functional and pretty – with crystal knobs, a chandelier and even a wall of shoes! After doing a little bit of research, I booked a consultation with California Closets. 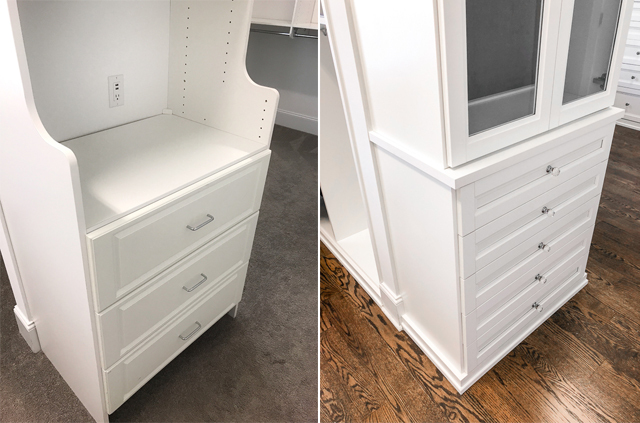 Back in October, Amber Colo (from the California Closets showroom in Greensboro) came over to see the closet and to discuss the changes I had in mind. Right away I could tell that she shared my vision for what the closet could look like, and confirmed that they would have no problem bringing my dream to life. To add the final touches to the space, we installed a chandelier and ordered a rug and tufted pouf for some additional seating. There are still a few empty shelves I need to fill, but I absolutely love how it turned out!! Overall I would HIGHLY recommend California Closets! They were able to bring some of my craziest ideas to life, and did it in a timely and professional manner. And if you live in the Greensboro/Winston Salem area, I would highly recommend working with Amber Colo, who is brilliant and is responsible for this whole thing! Thank you, Amber!! If you have any questions, let me know in the comment section! Your new closet is stunning. What a beautiful closet!! Absolutely a dream for every girl!! This is beautiful!! This would make picking out an outfit in the morning even more fun! 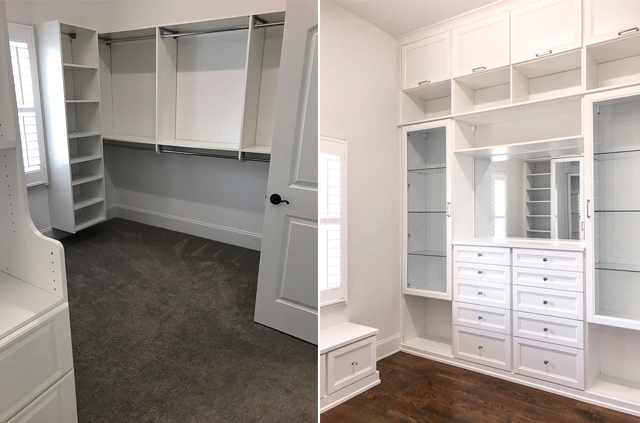 Wow, your closet turned out absolutely fantastic! Gorgeous!! Simply a dream! Where are your clothes? Can we see how you organized your clothes? What kind of storage is behind the full length mirror? I love the concealed storage at the top of your cabinets. Well done! I mean, that closet is dreams! OMG! 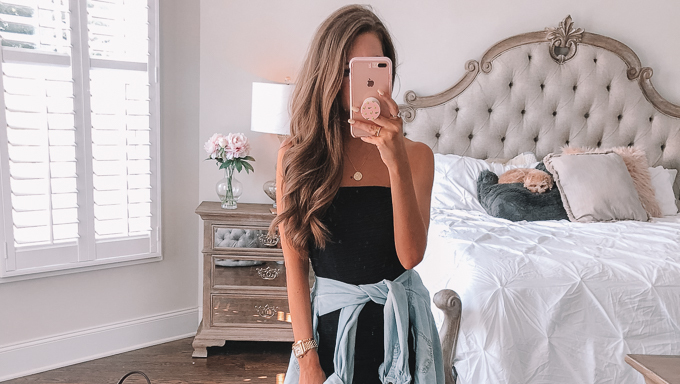 Your closet looks amazing Cait! What a beautiful room! Absolute goals! Your closet turn out amazing. Love it!!! Thanks for sharing- currently updating ny closet and this is major inspiration. Thanks! This is good timing as we are building a house and I am trying to find someone to help with our master closet design. I will call California Closets and see if they come to Statesville. So pretty! Love the high ceilings! I’m dying to see how you organized your clothing. I need some inspiration on how to group and arrange mine! Thanks!! Thanks so much for responding! Cant wait to see another post! I, too, would love to see the section where your clothes, scarves, sweaters are, please. Thanks. Gorgeous closet! Omg your closet is gorgeous!! I also love how your incorporated some organization in it! Girl it looks amazing! Love how you utilized all of your space. This is a DREAM closet! It turned out so well! This is stunning and everything that I want for my own closet! I have the same questions as one of the girls above…where are your clothes? and what is stored behind that mirror? Behind the mirror I keep folded sweaters and more shoes 🙂 the closet is split into two sides, so on the other side there are clothes racks for all the hanging clothes! It takes up the entire wall but it is very hard to photograph because of the angle! Gotcha! Thanks so much for replying back! A gorgeous closet! I love that you utilized the height for extra storage that was missing in the original closet. Oh wow, everything looks so perfect! I love it! It's absolutely beautiful. Seriously! I have three kids but you can't beat the brightness of white! Love it and congrats. First of all, this is absolutely stunning! So beautiful. Do you have separate storage for all your other shoes? I'm only seeing some of them here in your closet. I have such a problem with shoe storage (a good problem to have, of course), so I'm curious as to how you store all of yours! Hey! Yes I do have storage for my other shoes 🙂 these are just the shoes I consider "prettiest" and/or wear the most often! The mirror opens up to more shelving, so some are in there, and the other shoes I keep in my office closet! Beautiful! Is this whole side just for accessories/shoes? Where are all your clothes?! 🙂 I'll definitely have to look into this company when we buy a house. Hey Erin! The closet is split into two sides, the other half is where all of the clothing racks are for the hanging clothes! It was hard to take photos of hahah so I didn't include any! 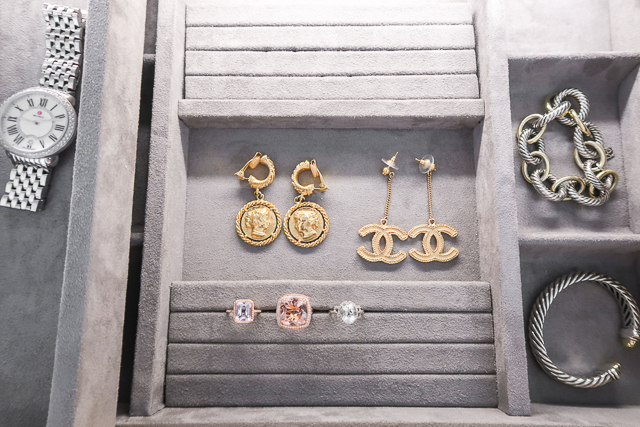 I love the dangle coin earrings that are in the jewelry box picture. Can you please share the link for purchasing those? GOALS girl!! This is SO stunning! 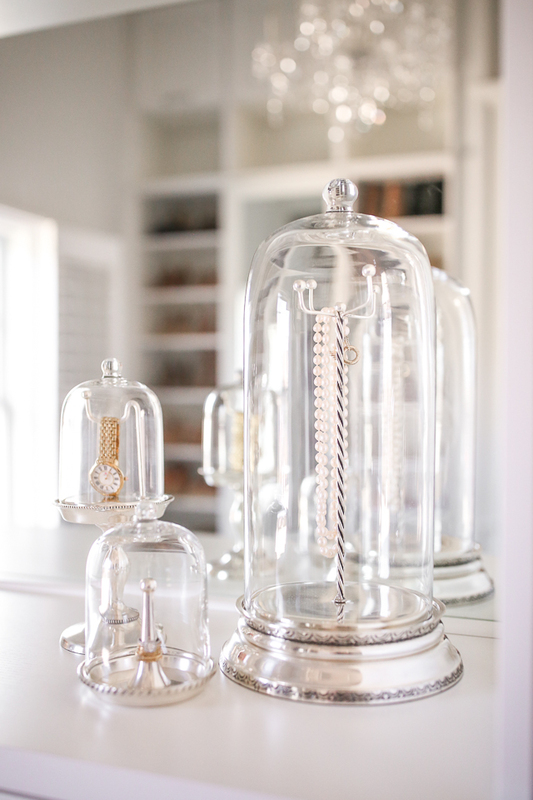 The jewelry under the glass on the shelf is seriously the cutest touch ever! UMMMM Amazing!! Such a beautiful job!! Wow! That is one fabulous closet. I like your style! I'm obsessed!! 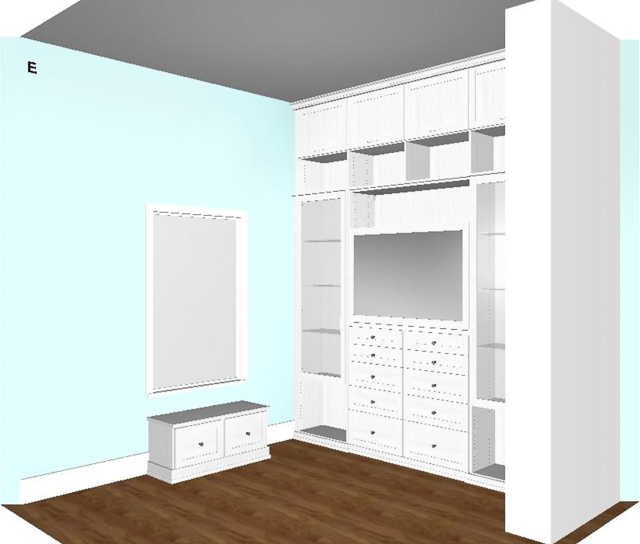 I recently went through the design process for our closet with CC, too! Ours will be very similar – I did the bright white but with dark hardware. We also have hardwood in our closet which I think is so stunning!!! Your jewelry inserts look a little different than the ones my lady showed me, were they offered through CC or did they get an outside vendor for them? Also, I'm adding that necklace hanging portion asap!! This literally would be my dream closet!! Stunning!! Beautiful! Where will your fiance keep his clothes? I love it ! I wish i had all those designer brands like you do! Beautiful! I'm so excited for you, there is nothing better than walking into a closet you love! Love it! Which do you prefer- the Gucci Soho Disco or the Gucci marmont flap? It looks absolutely perfect!! Gorgeous!! BAM! Nailed it. Your closet is amazing! OH MY GOODNESS! WHAT A DREAM! I love the ottoman! 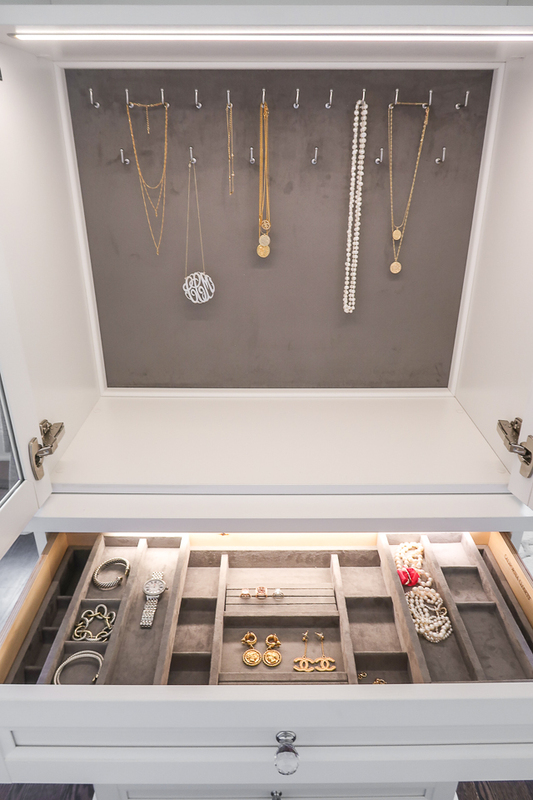 Your closet is simply stunning! Beautifully designed! Obsessed with your closet! Dream closet for sure! Closet envy! This is too amazing! Really really nice! it inspires me to change my closet as well! This is my dream closet! Everything you do is absolutely beautiful! 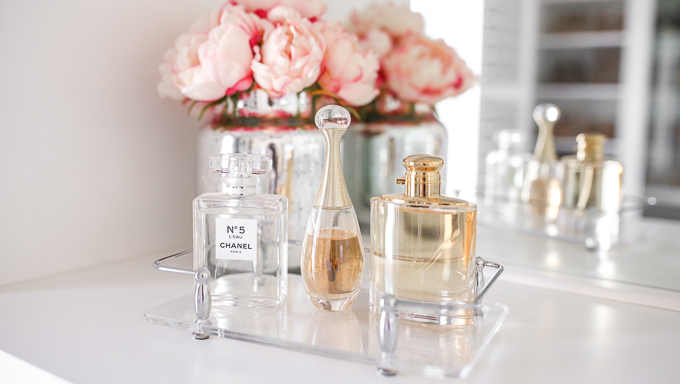 Do you by any chance remember where you got your little perfume tray? Everything you do is absolutely beautiful! 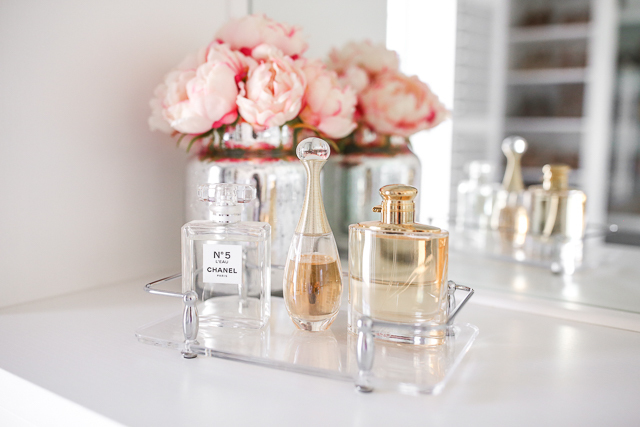 By any chance do you remember where you purchased your little perfume tray? Such a beautiful closet! I wanted to redo my closet and I considered California closets. 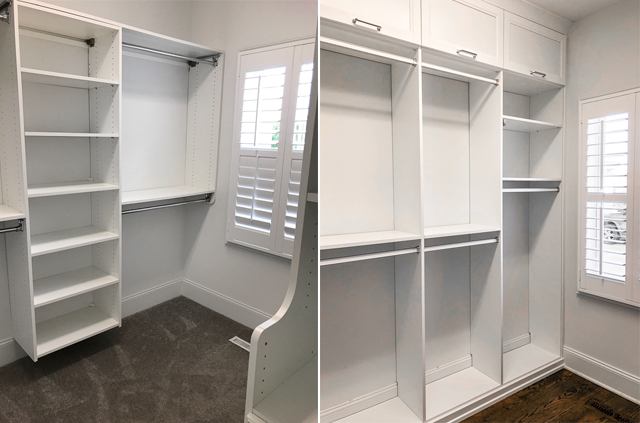 What is the ballpark for a closet renovation? I have a budget in mind but don’t know if that will be enough. Thank you so much! I’ve been looking on your blog for a couple of months and I really love all your pictures ! Can you please tell me which camera you use and which Editing Programma ? I really love it, and keep checking your Blog posts. I hope i can get an answer from you ! I’m literally so in love!! Your closet gives me life. I cannot wait to move into a bigger space for a bigger closet. IM IN LOVE WITH YOUR WARDROBE! 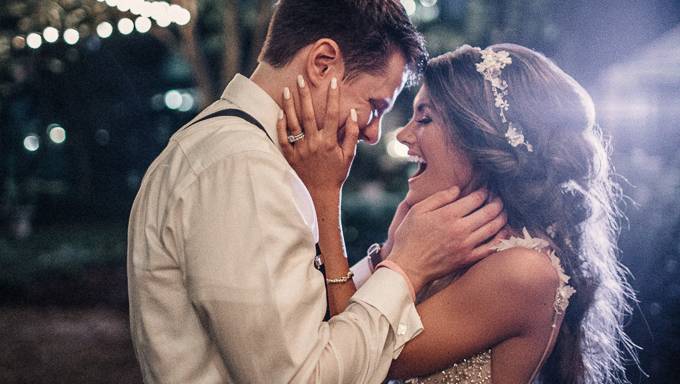 I’m in love with the ring on the left in your jewelry picture! Are you able to provide a link to it? Hey Caitlin do you have a partnership with California Closet or a discount code? I just did a consultation with them but just wondering if you know of a way to get a discount? Thanks girl! Love your closet and that’s why I want to work with them too!